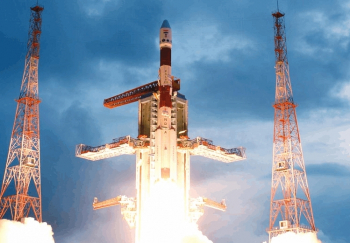 An Indian (ISRO) Polar Satellite Launch Vehicle (PSLV-XL) has deployed twenty satellites – including its primary passenger the Cartosat-2C satellite – on Wednesday in India’s fourth orbital launch of the year. Liftoff was on schedule at 09:25 local time (03:55 UTC), launching from the Second Launch Pad at the Satish Dhawan Space Centre. 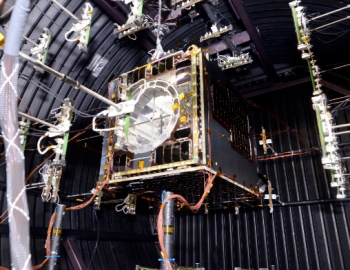 The primary payload for Wednesday’s launch was Cartosat-2C, an Earth observation satellite which will provide India’s military with high-resolution optical imagery. It is the fifth spacecraft in the Cartosat series and the third dedicated to military reconnaissance. Cartosat-2C follows the Cartosat-2A and 2B military satellites launched in 2008 and 2010 respectively. These were based on 2007’s Cartosat-2 civilian imaging satellite, itself a successor to 2005’s Cartosat-1. In addition to Cartosat-2C, Wednesday’s launch carried twenty secondary payloads, nineteen of which were deployed by the carrier rocket. 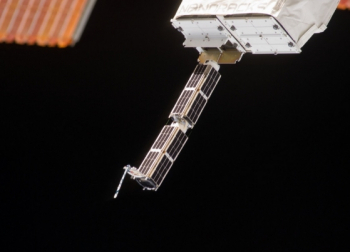 Twelve of these were Flock-2 CubeSats, forming part of Planet Labs’ constellation of commercial imaging spacecraft. Each satellite is a three-unit CubeSat, with a mass of approximately five kilograms (11 lb). Flock uses a large number of small, short-lived satellites to provide worldwide coverage, with the twelve aboard Wednesday’s launch – designated Flock-2p – the eleventh cluster of satellites to launch. It was the first time a PSLV has been used to deploy Flock satellites; previous deployments have mostly occurred from the International Space Station with the payloads delivered by Cygnus, Dragon or Kounotori cargo vehicles. A Dnepr was used to deploy eleven satellites, Flock 1c, in 2014. India’s own Sathyabamasat and Swayam spacecraft were carried for Sathyabama University and the Pune College of Engineering respectively. Sathyabamasat is a two-unit CubeSat which will use infrared spectroscopy to measure the atmospheric concentration of greenhouse gasses. Swayam is a single-unit satellite which is intended to demonstrate the use of the Earth’s magnetic field to provide passive attitude control for the spacecraft. Swayam also carries an amateur radio payload. The Bispectral Infrared Optical System, or BIROS, will be operated by the German national space agency, the Deutschen Zentrums für Luft und Raumfahrt (DLR). A 150-kilogram (330 lb) satellite, it is a followup to the TET-1 research satellite that launched in 2012. BIROS will operate alongside TET as part of a programme named FireBird, which will use the two satellites’ optical and infrared imaging payloads to detect heat sources on the Earth’s surface, with an aim of identifying forest fires. The satellite is expected to operate for three to five years. In addition to its primary mission, BIROS will be used to satisfy a series of technology demonstration objectives, including optical communications via laser up and downlinks and autonomous operation and navigation. A subsatellite, the Berlin Experimental and Educational Satellite 4 (BEESAT-4) will be deployed during the mission and will serve as the target for an autonomous rendezvous and departure demonstration. A single-unit CubeSat, BEESAT-4 was built by the Technical University of Berlin and carries a GPS receiver experiment. The Greenhouse Gas Satellite Demonstrator (GHGSat-D), or Claire, is a 15-kilogram (33 lb) satellite built by the University of Toronto Institute for Aerospace Studies (UTIAS) on behalf of GHGSat Global Emissions Monitoring, an environmental monitoring company based in Montreal, Canada. 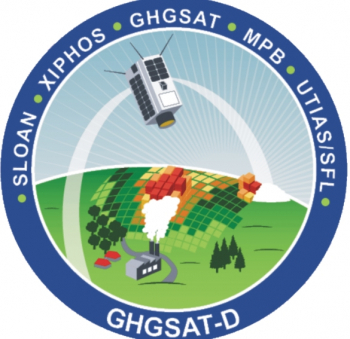 A precursor to the company’s operational fleet, GHGSat-D will be used to demonstrate a hyperspectral spectrometer operating in the shortwave infrared that will allow for the measurement of carbon dioxide and methane levels in the atmosphere. LAPAN-A3, or LISat, is a remote sensing satellite which will be operated by Indonesia’s National Institute of Aeronautics and the Bogor Agricultural University. The 115-kilogram (254 lb) satellite will be used to monitor the use and condition of land in Indonesia and to study environmental changes affecting it. 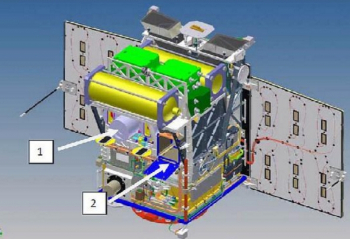 The spacecraft carries a quad-band multispectral imager and an optical digital imager. It is also equipped with an Automatic Identification System (AIS) receiver to relay position data and distress calls from ships at sea. The Maritime Monitoring and Messaging Microsatellite, or M3MSat, is a technology demonstrator which will be operated by the Canadian Space Agency (CSA) and Defence Research and Development Canada (DRDC). Developed in conjunction with Com Dev International, which was acquired by Honeywell earlier this year, the satellite is equipped with two AIS receivers intended to be more powerful than any already flown. M3MSat’s primary objective will be to demonstrate these receivers in orbit, both in independent operation and in conjunction with radar imaging from Canada’s Radarsat constellation. The SkySat Gen2-1 satellite, also designated SkySat-C1, is the first operational imaging satellite in the fleet of Terra Bella (formerly SkyBox Imaging), a subsidiary of Google which was formed in 2009 by four Stanford University graduates. Current plans call for up to twenty-five satellites, with the next four scheduled to fly aboard a Vega rocket in September. Six more will be launched by a Minotaur-C (formerly Taurus-XL) rocket in October. Wednesday’s launch was the thirty-sixth flight of India’s Polar Satellite Launch Vehicle. 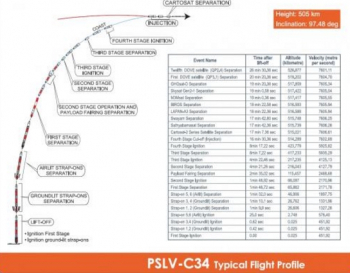 A four-stage rocket, for Wednesday’s launch it flew in the PSLV-XL configuration – the heavier of its three available variants – and will have flight number C34. With a total payload mass of 1288 kg (2,839 lb) the launch targeted a circular sun-synchronous orbit at an altitude of 505 kilometres (314 miles, 273 nautical miles) and an inclination of 97.48 degrees. Departing the Second Launch Pad at India’s Satish Dhawan Space Centre, the PSLV’s first stage ignited as the countdown reached zero. The solid-fuelled PS1 first stage is augmented by six PS0M-XL solid boosters, with the first four igniting in pairs 0.42 and 0.62 seconds after first stage ignition. The final two solids are air-lit, igniting twenty-five seconds after liftoff. The strapons burned for about seventy seconds, with the ground-lit motors separating in pairs two tenths of a second apart, beginning at 69.9 seconds elapsed time. The air-lit solids separated 92 seconds into the mission. One minute and 48.7 seconds after liftoff, the first stage burned out and separated, with ignition of the PS2 second stage’s Vikas engine occurring two tenths of a second later. Fuelled by liquid UH25 propellant – a mixture of one-part hydrazine hydrate and three parts unsymmetrical dimethylhydrazine (UDMH) – which is oxidised by dinitrogen tetroxide, the second stage powered the rocket for about two minutes and forty seconds, before its separation four minutes and 21.26 seconds after launch. During second stage flight, 46.1 seconds after ignition, the payload fairing separated from the nose of the vehicle. The vehicle’s third stage, or PS3, is powered by a further solid motor which burned for seventy seconds. Igniting 1.2 seconds after second stage separation, the conclusion of the third stage burn was followed by a coast phase as the PSLV ascended towards the apogee – or highest point – of its trajectory. The spent third stage remained attached to the vehicle during this coast, separating eight minutes and 7.2 seconds after launch, ten seconds ahead of fourth stage ignition. 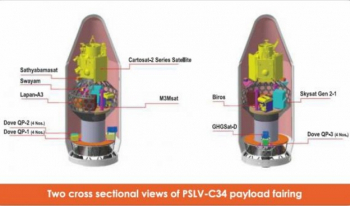 The PSLV’s fourth stage, or PS4, is a liquid-fuelled stage with a pair of L-2-5 engines burning monomethylhydrazine and mixed oxides of nitrogen. Designed to provide precise orbital injection for the rocket’s payload, the PS4 will guide the satellites into their planned deployment orbit. Although the stage only made one burn as part of Wednesday’s payload deployment, following spacecraft separation the stage is expected to be restarted as part of a demonstration geared towards future missions that may require this capability. The fourth stage’s first burn lasted eight minutes and 13.1 seconds. Approximately 37 seconds after cutoff, Cartosat-2C separated from the vehicle. This was followed by the separation of Sathyabamasat 35 seconds later and Swayam half a second after that. LAPAN-A3 was the next payload to separate, forty seconds after Sathyabamasat, with BIROS deploying two tenths of a second later. M3MSat and SkySat was released the same time apart, thirty-eight seconds later, with GHGSat-D following after twenty seconds. Deployment of the Flock CubeSats began a minute after GHGSat-D separated, with the twelve spacecraft released over a period of six minutes and ten seconds. 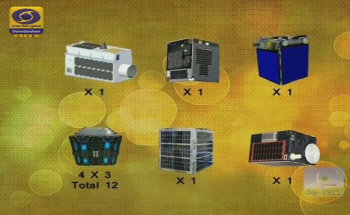 These were the last payloads to separate from the PSLV. Wednesday’s launch was the fourth of the year for India and for the PSLV, following three successful launches of IRNSS navigation satellites in January, March and April. Another PSLV launch is expected as early as next month carrying the ResourceSat-2A satellite and a cluster of small satellites. 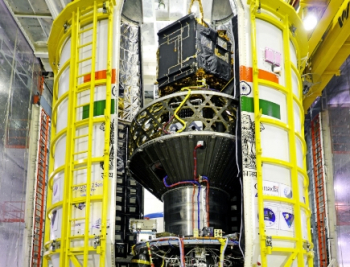 A GSLV launch with the INSAT-3DR satellite is also expected in the coming months, and ISRO’s GSAT-18 satellite is scheduled for a September launch atop a European Ariane 5 rocket.